MSF Field Coordinator Henry Gray gave this report while in lock-down due to security issues in an area of Abidjan. 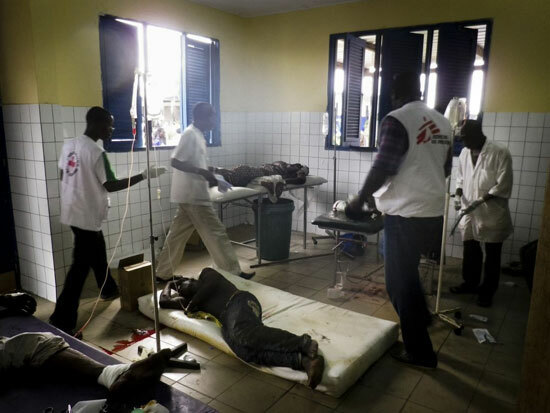 MSF staff treat victims of the violence in Abidjan at Abobo Sud Hospital. Henry Gray is a field coordinator with Doctors Without Borders/Médecins Sans Frontières (MSF) in Abidjan, Ivory Coast. He gave this report by phone while in lock-down due to security issues. It’s quite a hairy situation here at the moment. We’re hearing constant gunfire along with the occasional heavy detonation, and that’s been going on for a few days now. We had been moving around, visiting clinics and helping patients up until a few days ago. But the situation on the streets has deteriorated to such an extent that it’s just become too dangerous to go outside. 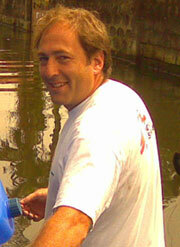 MSF field coordinator Henry Gray helped delivered aid in the Philippines in 2010. There’s a lot of pillaging and looting going on, and if you’re out on the streets, you’re basically a target. Armed gangs are out on the street and there is a real atmosphere of fear out in the community, particularly in the poorer areas. It’s weird, because Abidjan is actually a really nice city with well-maintained roads and nice bridges and big buildings. If you just landed here you could imagine you were in Australia or somewhere. But it’s not a great atmosphere here at the moment. There are a lot of people shooting each other, but what we’re finding is that the number of people shooting each other is a fraction of the population of the city. There are five million people in this city, and even though 20 percent of the population has fled, there are still a huge number of people here, most of whom now have no access to health care. It’s too dangerous to move to get to a clinic or hospital, and even if you get there, most of the doctors and nurses won’t have been able to get there. We heard about a woman in one area just the other day who had complications when she was giving birth, but the people attending to her couldn’t do anything. The army had blocked the bridges so they couldn’t get to a hospital in the south, and there was too much fighting going on, anyway. You get in a car to try and take somebody to a hospital and, more likely than not, you won’t be coming back. So it’s a bad situation, and the population is suffering because they can’t access basic medical care. Despite that, we have been able to treat some people. We had a team who delivered a baby this morning just down the road, which went well. And earlier on we had a small girl, nine or 10 years old, who came in with severe malaria and a fever that was over 40 degrees. We were able to treat her successfully and she’s fine now. Chronic cases are coming on; we can’t move them anywhere, but we can treat them here. We’ve been in lock-down here at the office for 24 hours. The other MSF teams in the city are also finding it difficult to move. But one group is in Abobo Sud Hospital on the other side of the city—this is the only hospital still working in that area of over one million residents. They saw 60 patients in the emergency department yesterday alone—50 of whom had gunshot wounds. There are about seven expats here with me and about 15 Ivorian staff. Most of the staff stayed here in the office with us last night, as it wasn’t safe to move. They’re not actually shooting at us, but whenever there’s a particularly long burst of gunfire going on we all find ourselves in the middle corridor saying "Fancy seeing you here". But the team is in great shape and the morale is high. The national staff are talking to their families on the phone and that’s basically how we’re getting our information about what is going on in different areas. They’re our eyes and ears, and we rely on them to find out where the fighting is, which areas are calm, and who is on the move. It’s difficult to say what’s going to happen in the next few days, but we hope we’ll be able to get to the people who need our help. We’re planning to open up a number of emergency posts throughout the city to stabilize patients who have been hit by bullets, and also for people who need emergency care. There are a lot of people out there who need our help.